Dear Friends, I have another homeopathic quiz for you to find the correct remedy. 3 years girl got bee sting when played into her foot. Nothing happened but next morning woke up with strong swelling of her foot that was very hot and very red at the same time. She could not stand neither cold nor warm application. Her mom gave Apis without effect. After giving the remedy after 3 hours the swelling almost diminished and redness and heat also. The child is almost normal after remedy which was only in 30c as mother could not get higher potency in her country so quickly. What is the remedy? As the bee sting happened at the evening and then she went to sleep, we do not have exact information how quickly it developed as she was sleeping, but in the morning it was terrible. I put myself 2 questions during the case analysis: 1) is this slow reaction, quick reaction or normal reaction? 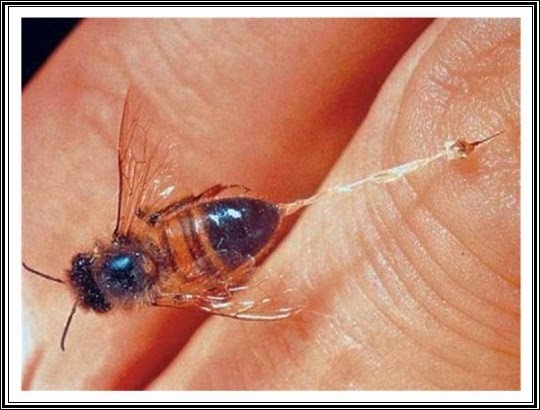 Answer is: we don’t know as mother said to me that she had some redness and pain as it is normal (immediately after the bee) but it was nothing compared to morning state. She said: nothing happened immediately after the bee sting, which means: nothing serious had happened after the bee sting. But we don’t know exact phase of night when it appeared as whole family was sleeping, so I could not take anything as reliable information, so I put it aside. 2) These thoughts bring me to question what is meant by sudden onset of symptoms. Does it mean that symptoms will appear immediately after exposure to exciting cause or it means that it can come later on but suddenly? In every case when the organism is exposed to information or stimulus towards which is very sensitive, it means that such information or stimulus find a suitable ground in the organism and therefore is capable to affect it (positively or negatively). But organism not always reacts instantly but starts to react when it understands the danger coming from such stimulus. When somebody gets flu, the organism will not react instantly but at the moment the bacteria or viruses will reach an amount that the organism recognize as dangerous and then the defense mechanism start to fight and creating symptoms. These symptoms will appear (after this incubation period) suddenly (concerning the pace of developing and also intensity) or slowly (more time, less intense). So according to my understanding when somebody is exposed to dry cold wind and the next day (not at the moment of exposure but one day after) all symptoms develop in very short time (suddenly) that is indication for Aconite (no matter that between exciting cause and symptoms was 12 hours). But in Bryonia it is different. In Bryonia symptoms can start to appear the next day also but it takes another 2 or 3 days for organism to develop full picture as the organism will developed it slowly. Does it make sense to you? It is hard to say what would have been happen if she got Hypericum instead of bell but I did not see any signs of Hypericum as red, heat and swelling resembles Bell. Anyway there are always a more remedies that possess a certain degree of similarity and we can say that more similar the remedy is the more effect will have to the case BUT there is only one that will touch the case really curative at the moment. That is why lot of people uses for instance Thuja for clearing up the warts but that is not what the classical homeopathy considers to be a real cure. Hope I clarified this subject to you.